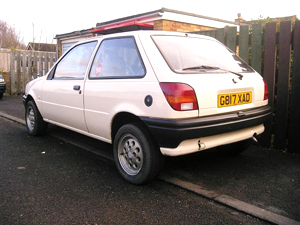 In 1989, the Fiesta saw the most radical redesign yet, and with the introduction of a 5 door model, the Fiesta was opened up to a much larger market. The car was revamped totally, using a new floor pan and shell, making the overall car much larger. This Fiesta was smoother than the Mk2 and followed Fords other designs at the time. The car was graced with an enormous choice of engines; in fact every person was catered for. Engines available were 1.0, 1.1, 1.3, 1.4, 1.6, 1.6 turbocharged, 1.8 and 1.8 diesels. Manual and automatic gearboxes were on offer as well as a huge range of trims and features. The Mk3 was also available in van and courier body styles, which remain the same as the passenger cars, just with a revised design of the shell. Trims on the Fiesta came wide and varied from the somewhat basic ‘Popular’ to the top of the range ‘Ghia’ model. Main variations of the Fiesta were; Popular, Popular Plus, SX, Classic, Quartz, Sapphire, Azura, Mistral, Flight, LX and Ghia. There were many special editions with their own packs of features depending on which engine was specified and what you required. Then came the somewhat sportier Fiestas, the S, Si, XR2i, RS1800 and RS turbo. Shown to the right is the Fiesta Si. This was a model introduced by Ford to combine the sporting abilty of the XR and RS models, with a more insurance friendly name. The car wasn’t in fact that much slower than the XR2i, and came exactly the same features as the later spec XR2i 16v cars. Equipment available was power steering, ABS brakes, dual airbags, high and supportive seats, lowered sports suspension and the new look bumpers exclusive to the Si model. 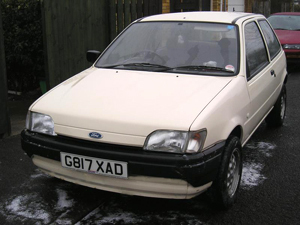 This stage of the Fiesta was the longest running out of the whole history of the model. After its spirited beginning in 1989, Ford finally stopped production in 1997 after a final run of the Mk3, under the name ‘Classic’. The Mk3, by this time was beginning to look slightly dated and so a revised version of the Fiesta was pulled from the drawing boards and put into production The post 1994 cars also had a stronger shell with built in side impact protection bars for added safety. The chassis was somewhat reworked, and these cars benefited from a redesigned suspension set-up. Often the two stages of the Fiesta could be counted as two separate cars due to the incompatibility of some of the products, but basically the cars look the same.